Hardwood flooring is not only beautiful, it is one of the best investments you can make for your home. It is durable and never goes out of style. With proper care, your hardwood floor should last for decades. Hardwood flooring grows more attractive as it ages and its depth of color will deepen with proper maintenance. How can wood floors be this easy to maintain? There are many advantages of owning a hardwood floor, value and beauty being an obvious two. It isn't until you get a hardwood floor do you realize that another advantage is simple maintenance. Hardwood is some of the easiest flooring options to keep looking like new. Once more cleaning tip: when liquid accidentally spills on the floor, act right away to prevent this moisture from warping or permanently damaging your hardwood. It doesn’t hurt to keep fresh towels nearby to make cleanup quick and easy. With proper care, hardwood floors will last for decades. But, what if you want the look of hardwood with the added bonus of water resistance? Consider waterproof composite flooring. Wood doesn’t react well to excessive moisture, be it from water or a cleaning product. Use cleaning products specifically manufactured for use on hardwood—like Murphy’s Oil Soap or Old English—in moderation and with great care. A little goes a long way. You don’t need to use a wood cleaning product every time you clean your floor. Sweep your hardwood with a simple dust broom and call it done. Once every few months, if you want to add that clean wood smell and shine, use a little as a final finish coat. How do I get rid of heel marks and scuffs? Wood flooring can collect scratches and shoe scuffs, especially near high-traffic areas. The best way to prevent this type of damage is to put doormats at your home’s entryways and request that your family and visitors wipe their shoes before walking on the hardwood. These entryway rugs will collect all of the dirt and grime that would otherwise be tracked on your floors. If your floor does get marked, use a damp towel to gently rub the mark away. 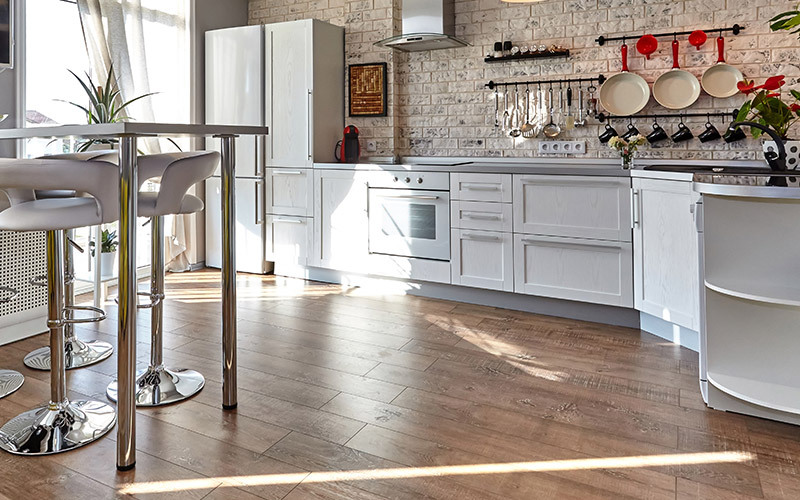 The Kermans Flooring design team pooled their expertise and created a free Hardwood Care Guide packed with tips and pointers to help you keep your flooring looking beautiful. Thinking about investing in hardwood floors? Stop by our showroom on the north side of Indy to see our great selection of options.